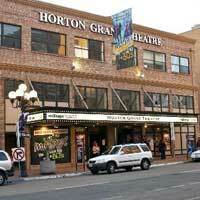 The historic Horton Grand Theatre is located in the heart of downtown San Diego's vibrant Gaslamp Quarter. This beautiful 250-seat theatre is located within easy walking distance to dozens of terrific restaurants, bars, and shopping. Due to the popularity of the Gaslamp's dining and entertainment area, please allow extra time for parking.